In a sauce pan, saute diced onion in olive oil until translucent, then add minced garlic and ginger. Add orange juice, white wine, low sodium soy sauce (omit for Passover) and honey and heat until the honey dissolves and the alcohol is cooked off. Let cool. (Use 4 parts orange juice to 1 part each wine, soy, and honey). 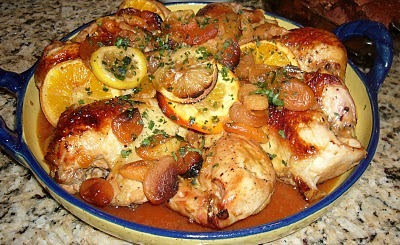 Arrange seasoned chicken breasts in a roasting pan with lemons, oranges, and dried apricots. Ladle sauce into roasting pan, at least half way up the sides of the chicken. Submerge fruit so it doesn’t burn. Bake at 350 until chicken is cooked. Keep chicken and fruits warm while reducing the sauce on the stovetop. Add a little dissolved potato starch to thicken if necessary. Serve sauce on the side. Garnish with parsley. This is a great recipe when cooking for a crowd. Looks delicious. I’m thinking of making this for Passover and I was wondering if you had the actual measurements of the ingredients? Hi Amy – gosh, that is an old one, I’ll look for the recipe and email it to you. Happy Passover. Thanks again for the recipe, Lori! I tested it out tonight so I could be all ready for Passover and it was a hit! My 5-year-old particularly loved it. Her plate was clean within minutes, which is SO unlike her (I even checked her napkin to see if she had hidden her food)!